As we approach another Mother’s Day, we as Americans reflect on the challenges facing some of the mothers struggling the most out there—single mothers living in poverty—and what we can do to create greater economic opportunity for all kinds of families. Too often the space in the national discourse for this discussion is clouded by myths, personal attacks, and stereotypes about this group of women. This Mother’s Day let’s move beyond the stereotypes and take a fresh look at not only the challenges facing single mothers living in poverty but also some of the policy solutions that can lift them out of poverty. Here are five things to keep in mind about poor single mothers this Mother’s Day. Single-mother families are nearly five times as likely to be poor than married-couple families. But when single mothers have a full-time, year-round job, the poverty rate for these families falls from 40.7 percent to 14 percent. (see graph) With two or more full-time, year-round workers in the household, the rate drops even further, to 4 percent. Stable employment and the contributions of another earner can play an important role in bringing down poverty rates among single-mother households. 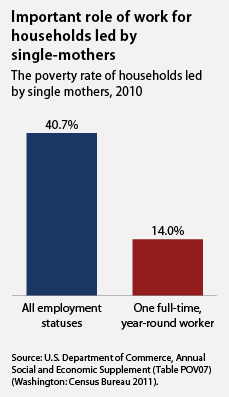 Nearly two-thirds of single-mothers also work outside the home. 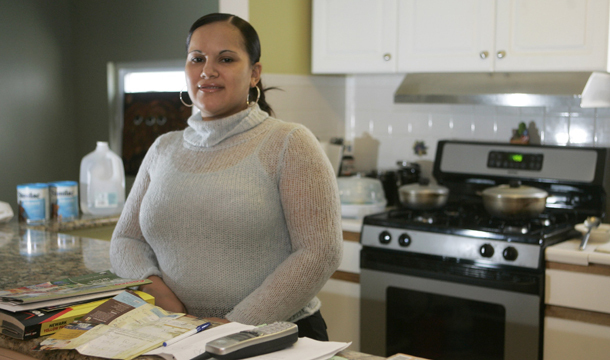 Job quality is critical for single mothers, who are especially likely to work in low-wage jobs. In fact, more than 80 percent of low-wage workers don’t have access to a single paid sick day. Without paid sick days single mothers are forced to choose between losing their job and caring for a sick child. A single mother with two children, working full time at $10 per hour, would slip below the poverty line if one of her children got sick, and she had to miss three days of work without pay. Inflexible work schedules and unstable child care arrangements can be significant barriers to work for single mothers in poverty. In addition to tackling the overall unemployment rate, it is critical to improve job quality, connecting workers to jobs that provide a family-sustaining wage and benefits such as retirement savings, health insurance, and paid sick days. The 1996 welfare reform law transformed income assistance for poor families from an entitlement program to a block grant, a program known today as Temporary Assistance for Needy Families, or TANF. Unfortunately, the number of families with children in poverty has risen since reform, but TANF caseloads have mostly stagnated or declined. This means that many poor families eligible for TANF, the majority of which are headed by single mothers, have been left out in the cold. Because of its flat amount and block grant structure, TANF was more constrained during the recession and could not respond as effectively to help more families in need. In contrast, the Supplemental Nutrition Assistance Program was able to quickly adjust to meet the increased need because of the dynamic nature of the program. A majority of the nation’s poor children live in single-mother-led households. Child poverty is not only morally objectionable, but it’s also costly. Child poverty costs the U.S. economy more than $500 billion annually as a result of lost productivity, negative health and education outcomes, and increased criminal justice expenditures. By extending ladders of opportunity to single mothers and their families, we can make a dent in child poverty, educate and equip children for tomorrow’s workforce, and increase our economic competitiveness. Work and income supports such as tax credits for working families, nutrition assistance, and housing vouchers lift millions out of poverty each year, boost our economy, and help families make ends meet. The safety net has faced and will likely continue to face troubling attacks by conservatives determined to restructure programs or make deep cuts in funding. A prime example is the Supplemental Nutrition Assistance Program, which is facing cuts of $36 billion over 10 years in addition to another $134 billion as articulated in the House Republican budget. As a result of these cuts, 8.2 billion meals would be lost by low-income Americans. Two million families would lose their benefits entirely and 44 million more would see their benefits reduced. With most supplemental nutrition assistance going to households with children, the majority of which are headed by single-parent families, single-mother families have a lot to lose should supplemental nutrition assistance be reduced or eliminated as part of short-sighted and ill-conceived deficit reduction efforts. Mother’s Day shouldn’t be the only day of the year that we celebrate mothers. By pursuing a progressive agenda to create good-quality jobs, advance efforts to offer paid family leave to all, and protect the safety net for those who fall on hard times, we can honor our nation’s single mothers every day. Katie Wright is a Research Associate with the Center for American Progress.